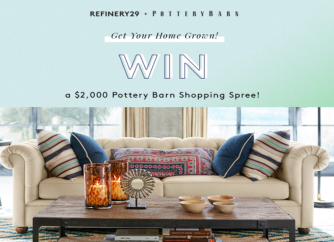 Pottery Barn + Refinery 29 Sweepstakes – Win a $2,000 Pottery Barn gift card! Win a $2,000 Pottery Barn gift card! ENTER SWEEPSTAKES HERE – Refinery29/Pottery Barn Sweepstakes page. ENTRY LIMIT – Limit one (1) entry per person/per email address, regardless of method of entry. ELIGIBILITY – The Sweepstakes is open solely to legal residents of the forty-eight (48) contiguous states of the United States (excluding Rhode Island) and the District of Columbia, who are at least eighteen (18) years of age and over the age of majority in their jurisdiction of residence at the time of entry. SWEEPSTAKES ENTRY PERIOD – The Sweepstakes begins at 12:00:00 am (midnight) Eastern Time on April 19, 2016 and ends at 11:59:59 pm Eastern Time on April 30, 2016. PRIZES – One (1) winner will receive Pottery Barn gift cards in the total amount of $2,000 (ARV: $2,000).